6:30 am and the alarm goes. It's a light drizzle outside, so I guess I'm going to ride. The next destination, Cappadocia is supposed to be some kind of "backpacker Mecca" so I don't want to waste one of my rest-days here in Aksaray. Repacking my panniers to assure that everything stays dry takes time, and I'm finally got on the road at 9:00 am. I have a smooth exit from town and the ride east is nice - rolling hills. Although the drizzle has stopped, the ride is wet since the bike tires are picking up every drop of moisture, but this rain-riding is a novelty and I'm fine with the situation. Somewhere around noonish the sky clears, my panniers dry out, and it looks like I might have to add sunscreen. Up ahead the sky is overcast however, and soon I'm hearing claps of thunder. Then it's raining, then it's pouring like hell! I'm amazed. I get out of the rain the first chance I get-a gas station awning-but it's too late. I'm soaked. I've been wearing the nice baggy windbreaker, but apparently it's not at all waterproof. Everything on me is dripping-wet. The attendant gives me two teas, and I'm very grateful, but it's not enough to keep me from getting a chill. After a half hour the rain lightens and I move on. Almost immediately it's pouring again. I pull over at the next gas station and again I'm invited in. I'm given two more teas and this time even food - pitas - the Turkish pizza. I offer money but they won't take it. I study my map, and ask questions. 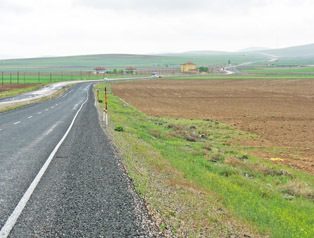 It seems that Nevsehir may only be 10 k away, though it's not clear if there's hotel there, and Göreme, the tourist-town, is only 12 k beyond that. I've been off the bike an hour now, and I'm getting colder; breaking into uncontrollable shivering-attacks. The rain starts to let up and I decide to add the long-john ski top as the inside layer, and get cycling again. It works; I start to warm up.. I make it to Nevsehir pretty quickly and, with no signage indicating the direction to Göreme, head to the downtown. At the busy three-way intersection I ask "Hotel?" and I'm pointed around the bend. 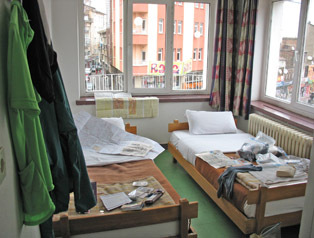 Sure enough, 20 meters away is the Hotel Ipek Palas, with a bright corner room with bathroom setting me back only 15 TL. "But don't use the bathroom," I'm told. I take a hot shower in the hallway bathroom, then return to spread-out my gear, and see how well my waterproofing effort held up. It didn't. I guess the bagging effort wasn't a total failure, but I'm definitely surprised to see how much got wet in spite of my efforts. The morning began with drizzle. 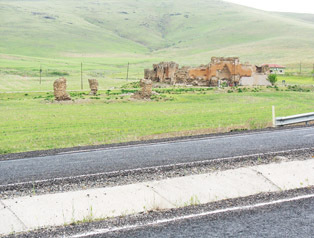 Orsin Hani Kervansarayi: Another Silk Road fortress - but one that didn't survive the centuries. 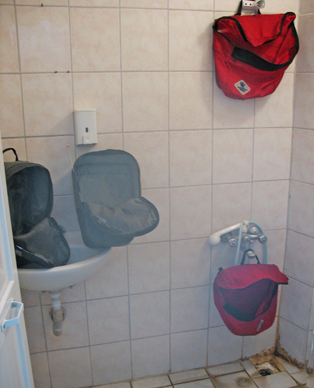 Drying the panniers in the bathroom. Drying the maps on the extra bed, and the window ledge.